ebbi Michiko Florence has held many jobs including fifth grade teacher, raptor rescue volunteer, and Associate Curator of Education for the Detroit Zoo. Today, she writes full time for children. She has a wonderfully supportive husband, and is mom to a 12-year-old daughter and a 6-year-old rat terrier. 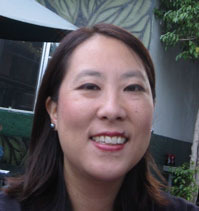 A third generation Japanese-American, Debbi was born and raised in California, but has called many places home, including Mexico City, Mexico and Shanghai, China. Her first book, CHINA: A KALEIDOSCOPE KIDS BOOK, will be coming out in early 2008 from Williamson Books. She is currently working on a book for the same series on Japan. You can learn more at her web site: http://www.debbimichikoflorence.com. Debbi: Thank you and happy anniversary! I’m glad to be here! As I suspect is the case with most authors, I’ve been writing all my life. From elementary school on, I wrote stories for fun, later taking creative writing classes in high school and college. It wasn’t until after I left my job at a zoo to marry my husband, Bob, and move to Mexico with him for his job assignment that I seriously considering writing as a career. It’s something I’d always wanted to do, but just never had the opportunity to actively pursue. I started out writing travel articles as the Mexico Correspondent for the travel e-zine, Victoria Brooks’ Greatest Escapes. After moving back to the United States, I tried my hand at writing short stories. My stories were published in the literary journal The Berkshire Review and in AIM (America’s Intercultural Magazine). My first love has always been writing fiction. After those small successes, I gained the confidence to try writing a novel. That was eight years ago. Since then, I’ve written several novels for teens. WOW: Those “small” successes are pretty grand when they nourish a writer’s self-confidence. With all this writing, you must be an avid reader. Were you a reader as a child? If so, who were your favorite authors? Favorite authors from childhood include Ruth Chew, Judy Blume, and Paul Zindel. Books I read over and over include the Amelia Bedelia books by Peggy Parish, Little Women by Louisa May Alcott, the Little House on the Prairie series by Laura Ingalls Wilder, A Wrinkle In Time by Madeleine L’Engle, and Lad: A Dog by Albert Payson Terhune. WOW: Good for your parents. I'm in the process of encouraging my teens to read more and try to buy books for them when they ask. With so many distractions for kids these days, what do you think it takes to turn them into regular readers? Debbi: I’m no expert, but I think setting a good example makes a big difference. Parents should read in front of their kids and should read to their kids. Additionally, in my opinion, parents shouldn’t force their kids to read nor force them to read certain types of books. Some kids like to read about dragons and magic. Some like to read realistic fiction. Others prefer nonfiction or comic books or books with bathroom humor. Kids should have permission to put down a book that isn’t engaging them (unless it’s a school assignment of course). Kids should learn that reading is pleasurable and not a chore. When my then second grade daughter announced to me that she didn’t like to read, I was, of course, heart-broken. When I asked her why, she responded that it was because she read too slowly. I let it go, but continued reading to her. By the end of the third grade, she’d improved in her reading skills and changed her tune and told me she was a Read-A-Holic and loved to read! YAY! It helps that her best friend also loves to read. Like many kids her age, my daughter also loves watching TV and playing her GameBoy DS, but she also chooses to read. WOW: Let's switch gears a bit. As writers, we know that getting your first novel published is extremely exciting. We’d love to take a walk with you down the path of your first book—how long it took from start to finish, and your road to publishing. Also, could you please share with us to whom you addressed that first query letter and what response you received? Debbi: I’m still hoping to make a sale with a novel. That’s something my agent, Jennifer DeChiara is working on now. I wrote (and revised many times) my first novel over eight years ago. I sent it out once, received a form letter rejection, and I tucked that novel away. Deep down, I think I knew it wasn’t good enough. It was a great learning experience. In fact, with each novel I write, I feel that I grow and improve as a writer. I wrote (and revised many times) another novel and I received some thoughtfully written personal rejection letters from editors. I continued writing and revising and submitting. I worked out of contract on revisions with one editor on a historical fiction picture book, but when the editor left the business I received no more interest from that house. Another picture book made it to an editorial meeting, but didn’t pass (due to similarities with a book they previously published). With each book and with each submission, I gained more confidence and kept learning. I’m not saying I enjoyed rejection, far from it, but the letters (and one phone call from an executive editor) continued to be encouraging. I joined critique groups and revised my work extensively. I paid for critiques at conferences and received encouragement from authors and editors. Finally, with my fourth novel, I caught my agent’s attention and she signed me on as a client--one of the happiest days of my career. WOW: That must feel wonderful! Congratulations! Can you tell us a little about how maintain a routine? Many writers use a set writing schedule to balance their writing and also their lives. Do you rely upon a set schedule, or moments of inspiration? Debbi: I definitely have a set schedule. I’m a creature of habit. I am a morning person, so I wake up by 6 AM and spend 30 minutes to an hour e-mailing and reading blogs. Then, I dive into work. I have a great writing group and we often log onto a chat program and work together. We set our goals and then work, checking in with each other to make sure we’re making progress. I usually work all day and keep my evenings free for family time. Wednesdays are sacred to me and are for full writing days. No socializing or talking on the phone, no housework or running errands. My family respects my writing time. I had to learn how to say no to friends’ invitations to lunch or shopping. If I didn’t respect my work time, then how could I expect others to? When I’m working on fiction, I usually write in the morning hours and then switch to reading or working on my web site. Right now, I’m working on researching and writing a kids activity book on Japan (to follow up my CHINA book) so I am working full days on that, and writing a minimum of 200 words on my new teen novel in the evenings. Debbi: Yes! If I get stuck while writing, it helps me to take a step back. I go for long walks or stare at the TV. Doing something mindless usually takes the pressure off of me and my subconscious gets to work. Once, I figured out the solution to a story problem while ironing (and I hate ironing)! I have to be pretty desperate to use ironing to get through writer’s block, though. As for procrastination, I’m a pretty good boss of myself and I don’t waste too much time, but e-mails and blogging are usually my forms of procrastination. Normally I give myself a time limit--say thirty minutes of e-mailing or blogging in the morning—and then I must start writing. It works for me. WOW: And a good boss deserves rewards. I've heard of writers who use email as a reward for getting things accomplished each day. But what about you? What is the greatest reward for yourself as a writer? Debbi: Losing myself in a story. I love getting to know new characters. I love making discoveries about these characters. And someday, when I have a novel published, I look forward to having a young reader lose him/herself in a story I wrote. That would be the ultimate reward. WOW: And what a reward! So, tell us, could you recommend a few starting points for other writers? In other words, places to visit, websites, or books that could help other writers begin to work on their craft? Debbi: The best thing I did when I decided to write for children was to join The Society of Book Writers and Illustrators. (http://www.scbwi.org) I learned about the craft of writing, the children’s publishing business, and I made friends with other writers by going to SCBWI conferences. I also read books on craft. Some that I recommend: Writer's Guide to Crafting Stories for Children by Nancy Lamb, Creating Characters Kids Will Love by Elaine Marie Alphin, How to Write a Children's Book and Get it Published by Barbara Seuling, and Stein on Writing by Sol Stein. For insight into children’s publishing, I recommend: The Complete Idiot's Guide to Publishing Children's Books by Harold D. Underdown, The Children's Writer's and Illustrator's Market edited by Alice Pope, and It's a Bunny Eat Bunny World: A Writer's Guide to Surviving and Thriving in Today's Competitive Children's Book Market by Olga Litowinsky. There are numerous helpful web sites, but two of the best are by author Cynthia Leitich Smith. Her web site (http://www.cynthialeitichsmith.com) and her blog (http://cynthialeitichsmith.blogspot.com) are full of great information and author interviews. And I can’t emphasize enough that the most important thing all writers can do is to read books in the genre they are interested in writing. I try to read 100 middle grade and young adult novels a year. WOW: Wow! That's a lot of books. What authors inspire you the most? Debbi: That’s a tough question to answer because so many authors inspire me. Great stories and characters inspire me and I favor young adult contemporary fiction and fantasy. To get an idea of the kind of books I enjoy, you can go to my web site (http://www.debbimichikoflorence.com) to see my reading lists from each year. Also on my site are interviews I’ve conducted with authors I admire. A few authors who inspire me are Laurie Halse Anderson, who gave me early encouragement during a critique at a conference; Cynthia Leitich Smith, who mentored me early on in my career; and Jo Knowles and Cindy Faughnan of my current critique group. There are many more authors who inspire me, but I’m afraid that list might be too long for this interview. Debbi: The path to this book sale was a little unconventional. My friend, author Nancy Castaldo, who has written many activity books, was talking to an editor she knew and when that editor voiced an interest in finding an author to write an activity book on China, she mentioned me and the fact that I was living in China. After Nancy let me know about her conversation, I contacted my agent, who in turn had a couple of conversations with the editor. I wrote an outline for the editor and to my happy surprise, she offered me a contract! While I had never considered writing nonfiction, this particular type of book was right up my alley. First, because I was living in Shanghai (for my husband’s job) and could do some research first hand. I was also taking Mandarin lessons (although I was never very good). Second, as a former teacher and zoo educator, I had a lot of experience with developing lesson plans and creating activities for kids. I also worked as an outdoor educator right out of college, so that experience helped as well. My editor let me come up with a lot of the topics I covered in the book, so I had fun researching. I recently signed a contract to do a second book with Williamson Books, this time for a book on Japan for the same series. WOW: Congratulations, again! Even though that’s unconventional you made sure to make it work. So, how long did it take you to complete CHINA: A Kaleidoscope Kids Book, from first its first sentence to the final one before you sent it to your agent? Debbi: I worked directly with my editor for this book, since I signed the contract before I wrote it. I’d say that I spent a little over four months researching, writing, and developing activities before I handed in my completed manuscript to my editor. This doesn’t include the revisions I’ve done for the book since. WOW: Along with revisions, what do you see as the biggest hurdle to overcome when writing for children? Debbi: This question makes me envision a hurdler on the track. There are a lot of hurdles, but each one is manageable with time and practice. Some hurdles are making the time to write, believing in yourself, dealing with rejection, and being patient. WOW: You mentioned your agent, Jennifer DeChiara, earlier. What was the path you took to connect with her agency? Debbi: An author I admired offered to take a look at my work and give me feedback as a kind of thank you for featuring him on my web site. I sent him my first four chapters of the novel I was working on. I looked forward to getting his input. To my surprise, he instead asked me permission to forward it on to his agent, cautioning me that he couldn’t guarantee anything. I understood and gave him permission. I’d heard him speak highly of his agent before, so I was especially excited and nervous. His agent was, of course, Jennifer DeChiara. She emailed me soon after and requested my full manuscript and three months later she called to offer me representation. HOORAY! I adore her and she’s the perfect agent for me! A little disclaimer: While it may sound like “it’s who you know”—and it certainly doesn’t hurt as long as you aren’t pushy (I never asked him to critique my work nor asked for a recommendation),--ultimately, it’s the writing that will secure the agent/editor. I’m positive that had Jennifer not connected with my writing, she would not have offered representation. WOW: That’s true. The writing is the key in the end. Speaking of writing, do you write for adults? If so, what is the biggest difference between writing for adults vs. children? If not, do you think you ever will? Debbi: I started out writing for adults (short fiction), but when I started writing novels, I found that I most related to teen characters. I think my inner age is set somewhere between 13 and 15. Also, when it comes down to it, I enjoy reading books for teens more than books for adults. In fact, I’ve successfully convinced several friends/family members to branch out into reading middle grade and teen fiction, and they’re converts. The differences between writing for adults vs. children/teens are complex, and an entire article or lecture can be devoted to the topic. I’m not sure I’m the best person to lead that discussion. I believe it’s not about the writing. Writing for children isn’t easier than writing for adults. Writing for children doesn’t mean dumbing down the writing. Put in the simplest terms, it’s about the protagonist who is not an adult. It’s about a protagonist who solves his/her own problems without the aid of an adult. It’s about a protagonist with a voice that rings true to his/her age. But like I said, that’s a very simplistic answer and I know I’m not doing it justice. WOW: I love that answer. As we come to the end of our time together, would you share a few words of wisdom with our writers and readers? Debbi: I’m mentoring two beginners to the field so these are some things I’ve been telling them as they get started. Of course, every writer has his/her own way of writing. If there were only ONE right way to do this, we’d all be multi-published by now! The trick is to figure out what works best for you, as a writer. First drafts can be crappy. First drafts are only for the writer. Enjoy it! Have fun! I never share my first drafts for critique. Don’t expect nor desire that first draft to be perfect or you may never get started. Just write. Be patient and work on your craft. Take the time to really revise (many times) and rewrite your work. Revision doesn’t mean changing a word or two. It means digging deeper, making the hard changes, figuring out the real story, and truly getting to know your characters. Find a great critique group or writing partner. This can be a challenge. Finding people who give good critiques is sometimes hard. I was blessed to have a great crit group when I was living in Albany, NY (I miss them) and I’m blessed to have found my current online group. It’s all about trust and respect. Be open to suggestions and be willing to try something new or different. And I’ll repeat my earlier advice: read, read, and read! WOW: Yes, reading cannot be over-emphasized! Thanks, thanks, and thanks! Seriously, we appreciate your willingness to share your experience with us and our readers. It has been a true pleasure, and we wish you great success! 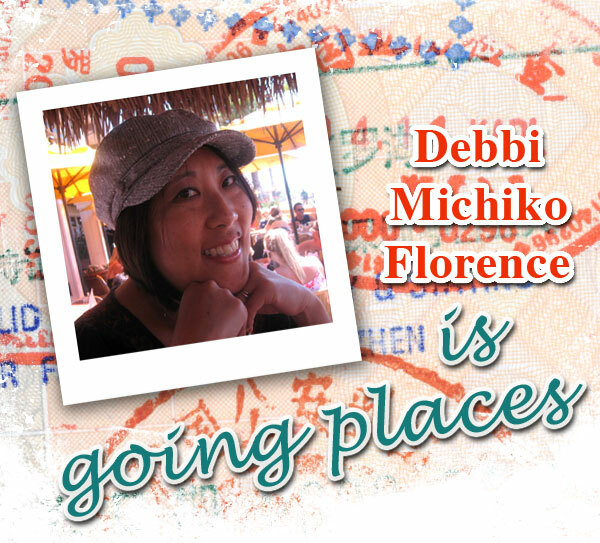 Find out more about Debbi Michiko Florence by visiting her web site: http://www.debbimichikoflorence.com. And stay tuned for her book, CHINA: A KALEIDOSCOPE KIDS BOOK, coming out in early 2008 from Williamson Books.